Tee-riffic DIY …. no sew project. Have you ever wanted a cute halter top with your favorite Tee Shirt Design Logo.. ?? Or just want to re-purpose an older Tee that looked a bit … old and out of date? Duhhh.. of course YOU have..
Cut back of shirt from arm pit to arm pit.. making sure to ONLY cut the back of the shirt it will be a flap after you cut off your neck .. so easy to identify. Cut center of what is left of back straight up (vertical cut) to separate back with an opening .. all the way thru. Open shirt and cut off bottom hem. Measure the chest area of your shirt.. I actually put this on to figure out where I want to tie my shirt.. mid chest is a good idea.. so not to have a gap where you can see in your shirt. Put your shirt on .. tie top neck straps, tighten the mid chest strap and either bow tie the bottom or as I did FOLD over and pin in inside of shirt to keep from falling out..
Walla.. a new fun Halter shirt. 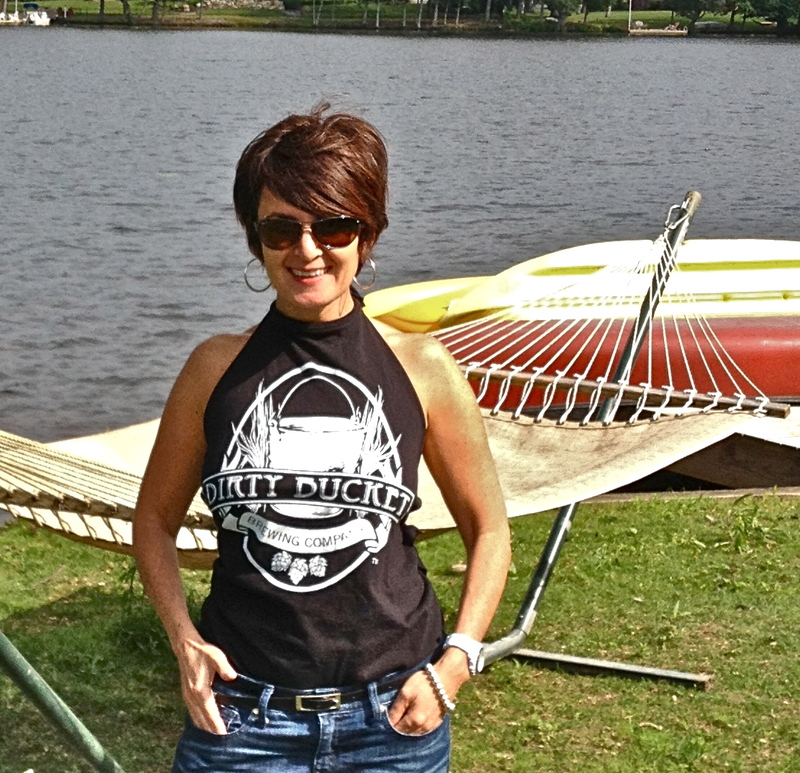 A big Thanks to my good friends Steve and Sharon for donating a great Dirty Bucket Brewery Tee for this DIY project.. visit their webpage for some super duper craft beer.. http://www.dirtybucketbrewery.com or pick up your own tee shirt too. Gallery | This entry was posted in create a great day !, personal style, Uncategorized and tagged dirty bucket brewery, DIY, T shirt project, the happy health counselor, vanity, vanitysanityandhealth.com. Bookmark the permalink. 4 Responses to Tee-riffic DIY …. no sew project. You’re more than welcome. Love you’re site and the way you inspire others. Thank you Dirty Bucket Crew… YOU always inspire me too.. win/win.. Happy Day !.. cute—but you make it look too cute and easy! I think you have a new business model— love it and would love my ugly tshirts to look cute and sassy like this one. Thanks Anonymous…. hmmmm it is true.. some of the simplest ideas are really big winners.. appreciate the encouragement ..